On a pilgrimage, Eydis is shown a vision of the destruction of the world by the Mother. Rathnakar, an evil sorcerer has escaped his imprisonment and to stop him, Eydis must find two other companions. The unlikely heroes turn out to be Orrick of Kroad, a notorious traitor, and Geveral, a dryad mage who can’t control his powers. 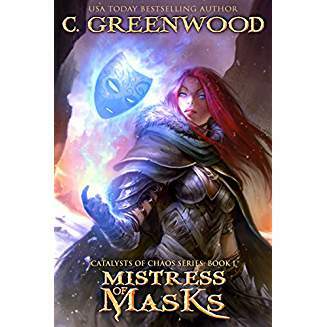 During her quest to find these heroes, Eydis discovers the Mother has given her the power of Masks. She can temporarily change her face and that of her companions. The reluctant companions race to stop Rathnakar even as he sends his savage undead warriors after them. I liked this story. It’s well-written and has enough action, mystery, and heart to engage me and keep me reading well into the night. I was kept in suspense not knowing if Orrick could be trusted or if he had nefarious designs on Eydis. This is the first book in the Catalyst of Chaos series and I’ll definitely be reading the other books.